Continued my run of parkrun tourism by heading over to Bedfont Lakes parkrun this morning. 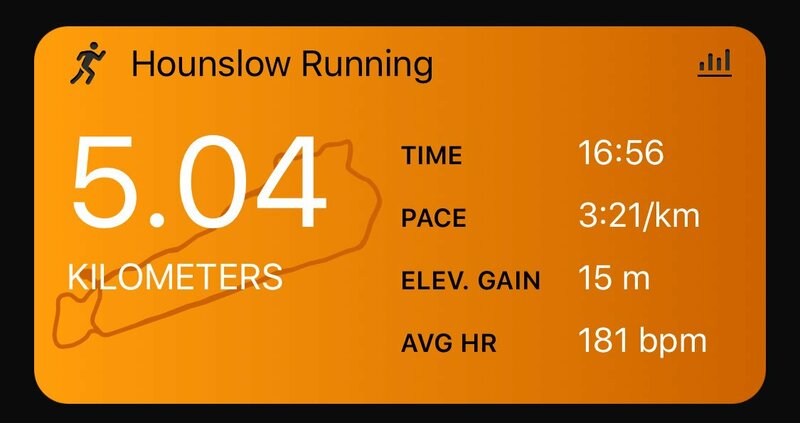 Felt on top form and decided last night I'd use today's run to go for a new PB - it's now or sometime after Comrades so may as well have a go now. Peeps' Strava entries suggested it was quite a flat course, but on my reccie I discovered it's not really that flat but rather slightly undulating, with a bit of a long gentle uphill back to the start/finish. It also has a few sharp turns and quite a few potholes. I didn't let this bother me and shot out of the gates at the start waaaaaay too quickly: 3:14 first km 🤭 Backed off a bit and was then forced to back off a bit more by the long slow climb and what the locals call "Mo Hill" which I didn't notice on the first lap, but definitely did on the second. Pushed hard in the last km to make sure I dipped under 17 mins. I've finally dipped under 17mins for 5k and smashed my previous PB by 14s 🎉 First PB of the season and my oldest of the distances run in the UK. Of course now I'm wondering how much quicker it would have been if I'd run on a faster course like Blackpark. I'm pleased as punch and definitely looking forward to Comrades next weekend. Umhlanga parkrun on the Saturday will also be my 100th parkrun and what better place to do it than back in my homeland 🇿🇦. Now for a flight and a week's recovery before tackling the Comrades Marathon next weekend. I can't wait.